It’s difficult harvesting vegetables in the city, but the result is often well worth the effort. Below are some bright ideas for creating your own city garden. When cracking eggs for breakfast, save 3/4 of each shell, then rinse them with water and allow them to dry. Using a safety pin, carefully poke a hole in the bottom of each shell, as this small hole will serve as an exit for future roots to use. Fill the eggshell 3/4 full with dirt. Plant your seeds! 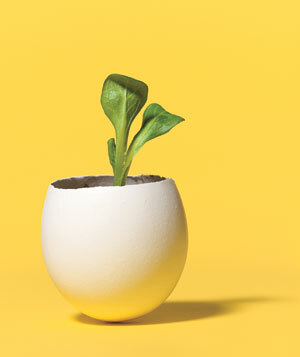 When they begin to sprout, you can plant the entire shell into the garden. Ultimately, the roots will break through the shell’s base and, as the shell crumbles, will absorb fertilizer from the surrounding soil. You can also skip the shells and simply use the cardboard to get them started. The Micro-Green grow box is also meant to be the end all answer to your city-gardening needs. All you need is a windowsill! Now that your plants have sprouted, you have to decide where to put them; an obstacle that needn’t obstruct your urban garden plans! One option is to hang them from a door. Another vertical gardening option is to build shelves, using containers you can collect from recycling, Good Will, or other second hand stores. Additionally, you can create your own shelving (that is easily dissembled in the autumn and stored for next season) using a ladder and some boards. 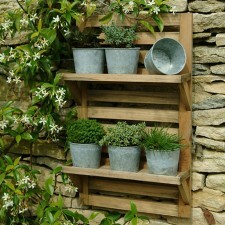 And, of course, there is always the option to purchase something like this designer trellis. Choosing the right plant for your garden is also important. Peas are natural vertical growers that are beautiful because they climb towards the sun, sharing their flowers along the way. Hint: Provide a small base and something for them to crawl up. Spider Web Style – have fun with your strings; the peas will follow your lead! You can also finally make use of that ladder you’ve saved in case you might need it. By hanging wires from the rungs to each pot, you will encourage many happy vines to sprout with the additional benefit of creating a little privacy from your neighbor. Here’s another example of good, old-fashioned, resourcefulness. Use what you have (a ladder, old chair, fencing). Construct a bin by drilling 1/4″ holes 4″-6″ apart to allow the compost to breathe. Begin filling your compost by the green/brown rule: Three parts brown to one part green. Wet everything until it has the consistency of a wrung out sponge. Smell-you-later: top your greens with more browns to keep your bin working properly and avoid smelling. Continue the layering with one part green, three parts brown, one part green, etc. Rotate or stir your pile weekly, checking for the bottom to smell earthy and to appear very dark and crumbly (this normally occurs after 6 months). Harvest your fertilizer to help harvest your crops!